Imagine a city nestled on a high desert plain with a backdrop of the magnificent Rocky Mountains, and imagine a pristine river meandering through the city’s center. Got it? That’s Boise, Idaho and Homes for Sale in Boise impress buyers in every price range. Boise has deep historical roots dating from before the gold rush days of the 1800s. Once owned by the Hudson Bay Company as a fur trading post, a fort was established at the mouth of the Boise River, some forty miles from where present-day Boise is located. The town, known as Old Fort Boise, was abandoned after frequent Indian raids. When gold was discovered in the Boise Basin in 1862, it was more important than ever to protect not only the residents but travelers to the area. A new location was selected and construction began in the summer of 1863. The town grew quickly, partly because of the gold rush, but also because of it’s location on the Oregon Trail. The Oregon Trail was a well-traveled thoroughfare for thousands of people heading to the Oregon Territory. Of all the roads leading westward, the Oregon Trail was the longest. It began in Independence, Missouri, and ended over two thousand miles away in Oregon City, Oregon. In addition to the Oregon Trail, routes to the Boise Basin and Owyhee mines also intersected with the Oregon Trail. Because Boise was located at these major crossroads, it became a bustling commercial center. To this day, in the southern part of Boise, wheel ruts can still be seen along areas of the old trail. In 1864, Boise was incorporated as a city and designated the capital of the Idaho Territory. However, after the gold rush, Boise’s population declined until 1872 when Boise began to slowly grow again. Construction on the state capitol building was completed in 1886 and in 1887 Boise built their streetcar system. Three years later, Idaho officially became a state. While the Great Depression which came several years later ravaged many cities in the nation, Boise enjoyed steady growth. Boise, known as the City of Trees, boasts many museums, cultural centers, and urban parks. The easily accessible outdoors of Southwest Idaho beckons visitors to enjoy the scenery of nearby mountains, desert sand dunes, canyons, and whitewater rafting rivers. Many have discovered the wonderful schools and Homes for Sale in Boise. The famous Boise River runs through the middle of Boise and offers not only a beautiful landscape that leaves many cities envious but provides valuable irrigation water for farmers and sports enthusiasts. It provides water for thousands of acres west of the capital city and one can see kayaks, float tubes, rafts and fishermen line the river through the spring summer and fall. The river is a beautiful natural river and the colors that border the river in the fall is something to behold. Two major parks make their home in Boise and these include Julia Davis Park and Ann Morrison Park. 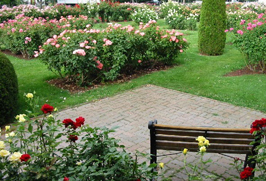 Julia Davis Park is known for it’s beauty and the 89.4 acres it encompasses includes the stunningly beautiful Rose Garden (shown), Zoo Boise, Boise Art, The Idaho State Historical Museum, Idaho Black History Museum and The Discovery Center of Idaho. The park also includes the Gene Harris Band Shell, a play ground, two picnic shelters and a lagoon with paddle boats. Ann Morrison Park is known for it’s stunning beauty and it’s 145 acres includes a large reflecting pond complete with a huge spray fountain in the middle spraying water several feet in the air. Gardens, a Candy Cane Playground, softball diamonds, tennis courts, football and soccer fields and a picnic pavilion are all part of the marvelous park. The beautiful Boise River Greenbelt borders the park and offers an exit for floaters during the summer months. In town, you can enjoy shopping in renovated historic buildings which offer a wide variety of specialty shops, restaurants, and quiet surroundings for relaxed browsing and buying. For more traditional shopping, the Boise Towne Square Mall located on the west side of the city, has over 200 shops. Also available are many unique, high-quality restaurants, from quaint ethnic eateries to four-star establishments that will certainly appeal to anyone’s palate and pocketbook. During the warmer days of spring and summer, you can dine in the fresh air in balcony or sidewalk seating. Agriculture has always been the backbone of Idaho. Idaho has always known for it’s “Famous Potatoes” but a lot more is going on in the agriculture sector than potatoes. Central to north Idaho is known for it’s large vast wheat fields and forestry. South eastern and south central Idaho is known for the majority of the potatoes grown in Idaho. Southwest Idaho is know for growing a vast variety of crops which includes potatoes, sugar beets, onions, Hops, corn, alfalfa, alfalfa seed and hundreds of varieties of seed crops including but not limited to onion, carrot, flower, etc. seeds. Southwest Idaho actually produces the vast majority of seed crops grown in the country. One thing you will see in nearly all parts of Idaho is is cattle and horse operations. Larges sophisticated dairies have also become a common site in south Idaho. The Idaho economy was given a big shot in the arm when Micron Technology was founded in 1978. Micron has grown to be one of the world’s largest DRAM and computer chip manufacturers. It is Idaho’s largest employer and has expanded into neighboring Canyon County where it manufactures and sells computers under the brand name “Micron”. Hewlett-Packard is a name known world wide for reliable and durable computer printers. The company calls Boise “home” for it’s printer division and is one of the states major employers. It has played an important role in the economy of Boise and is one of the most respected employers by it’s employees. USA Today recently wrote a very compelling and powerful story about Idaho and the reasons Idaho has one of the strongest economies and is one of the most desired states to live in. Read No End In Sight For Idaho’s growth The article opens by making the bold statement that with all due respect to Phoenix, Las Vegas and Orlando, the heart of America’s biggest economic boom is right here in Idaho. For prospective home buyers, Boise, ID real estate offers a wonderful mix of neighborhoods and subdivisions which have the amenities any new resident would desire. The area also offers the character of a large metropolitan area, steeped in rich history and with almost indescribable natural grandeur. The array of Homes for Sale in Boise ranges from entry level to turn of the Century mansions.